Nonprofits are often seen as the poor step-children of America’s business world. They're not. They are heroes. They have passion. Their contributions to our communities are immeasurable. And technology plays an important part in enabling nonprofits to make those contributions. Information Technology in particular should empower nonprofits to be more effective. To serve their communities. Not stand in the way of positive change. Heroes need a sidekick to help make great things happen. And that's where The IT Guys come in. Information Technology can and should be a tool for those who want to make the world better. But often, there are obstacles that stand in the way. One of the biggest is the Nonprofit Starvation Cycle. What is The Nonprofit Starvation Cycle? The Nonprofit Starvation Cycle is a sinister process that deprives nonprofits of funds needed to effectively carry out their missions. Funders often have unrealistic expectations about overhead spending, pressuring nonprofits to cut costs in potentially unhealthy ways. These cuts often lead NPOs to neglect their critical infrastructure. This neglect erodes an organization's ability to effectively carry out its mission, often leading donors to take their funding elsewhere. And the cycle starts all over again. Organizations that build robust infrastructure—which includes sturdy information technology systems, financial systems, skills training, fundraising processes, and other essential overhead—are more likely to succeed than those that do not. This is not news, and nonprofits are no exception to the rule. The Cycle is deadly. Nonprofits caught in the Starvation Cycle are gradually worn down, becoming less effective in the process. Infrastructure ages, morale sags, and donors are left wondering why the agency doesn't perform better. Agencies living with the Cycle settle for a three-pronged coping strategy; low pay, make do and do without. Here's why. Expectations - Donors often see overhead spending as wasteful. They impose an arbitrary “overhead ratio” to gauge the effectiveness of an agency. Nonprofits that do not meet this benchmark are less likely to receive funding. Pressure - To satisfy donors' unrealistic overhead ratio expectations, NPOs feel pressure to lower perceived overhead spending. They accomplish this either by cutting costs or through "creative" accounting. By conforming to unrealistic expectations, nonprofits further validate the erroneous concept that overhead is synonymous with waste. Neglect - Bowing to donor pressure, nonprofits cut spending on infrastructure to reduce overhead. One of the most common casualties is Information Technology. As IT budgets are slashed, organizations become less effective. The Cycle restarts, but donors are now less likely to donate due to loss in agency effectiveness brought about by spending cuts. The limitations in organizational infrastructure ... have real consequences for organizational effectiveness. As the Nonprofit Starvation Cycle grinds away, all aspects of nonprofit life are impacted. Donors seek lower overhead. Infrastructure is degraded. Staff is less effective. In the end, programs suffer. Donors pressure NPOs to cut overhead by applying an arbitrary "overhead ratio” as a benchmark of agency effectiveness. Agencies feel a need to conform to unrealistic and restrictive expectations. In an effort to conform to overhead ratios, NPOs cutback spending anywhere they can. Most often these cuts result in reduced spending on critical infrastructure such as Information Technology. Nonprofit staff is incapable of working at optimum efficiency because of inadequate infrastructure. In addition, staff moral suffers due to frustration with aging equipment. Programs suffer as agencies labor under self-imposed inefficiencies. Goals are not met. Donors pressure the agency to further reduce overhead. The result? Increased operational inefficiency and reduction in staff productivity. The Nonprofit Starvation Cycle isn’t something The IT Guys made up. This viscous cycle is very real and all too common. It was first clearly identified in a study by Stanford University, and fleshed out with a study from Indiana State University. The IT Guys didn’t create the term, but we’re dedicated to ending its effects. 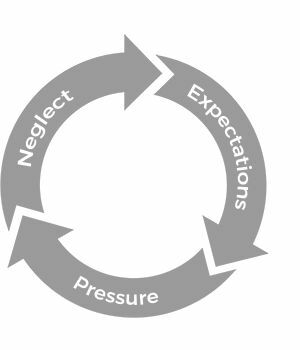 The Non Profit Starvation Cycle puts into concrete terms the process that repeats itself everyday in the nonprofit world. It impacts agencies no matter what size. Many don't survive. So what's to be done about it? The NPO world needs a plan. To break the Nonprofit Starvation Cycle, the IT Guys have created a visionary Information Technology plan. A plan designed over period of years through the combined input of nonprofit leaders and Information Technology experts alike. The result? A unique approach to nonprofit IT management. One that will break the Nonprofit Starvation Cycle and unleash the potential of every NPO, no matter how large or small. We designed the 501cloud cloud with one over-arching goal; total management of our client IT resources. We don’t just fix IT problems. Instead, we manage client IT infrastructure as an outsourced IT department. This management process is embodied in 501cloud. The 501cloud management plan delivers a virtually problem-free Information Technology environment to clients who didn't think it was possible. This totally cloud-based infrastructure empowers an organization's staff to work anywhere, any time. A great Information Technology plan is useless if it's not affordable. So, The IT Guys also deliver a winning financial strategy. With 501cloud, variable and unexpected capital Information Technology expenditures become a fixed operating cost. Let that sink in for a minute. Unpredictable IT costs, from acquisition to support, are a thing of the past. Equipment and support costs are reduced to a simple, monthly budget line item. Future IT costs become perfectly clear. No surprises. The IT Guys clients know exactly what their budget is going to be for years to come. No financial crystal ball required. There's not an NPO Board around that can't see the value in that. Find out how your organization can break the Nonprofit Starvation Cycle. Contact The IT Guys and see how a strategic IT plan can make a difference now!